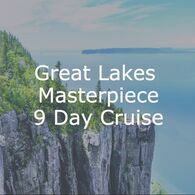 The 15-night Great American Waterways Cruise from Blount Small Ship Adventures offers a tour of four of North America's Great Lakes plus the historic Erie Canal. Embark in Chicago, Illinois for an evening sail across Lake Michigan, and start your journey across the lakes with a visit to the Maritime Museum at Manitowoc, Wisconsin. 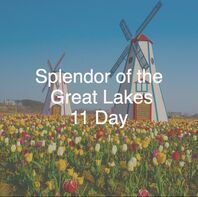 Trace the coast of Michigan with stops at the Victorian world of Mackinac Island and Greenfield Village near Wyandotte, before continuing on to the great industrial cities on Lake Erie. Visits to the historic villages of Lake Ontario are the perfect preparation for your arrival at Buffalo, New York, where you'll enter the Erie Canal and make your way to New York City. Cars are forbidden on Mackinac Island, Michigan, to preserve the quaint Victorian ambiance. Traveling from the port by foot, bicycle or horse-drawn carriage, make your way to the island's famous Grand Hotel. On a clear day, don't forget to ascend to the cupola to take in the extraordinary view. History lovers will enjoy a tour of Fort Mackinac--the site of battles in both the American Revolutionary War and the War of 1812. Docking at Wyandotte, Michigan, spend the day at The Henry Ford Museum of American Innovation, dedicated to the people and ideas that inspired, informed, and engaged the world. The museum's collection showcases the evolution of the American automobile, innovations in flight from the Wright Brothers to modern air travel, and a host of historic artifacts from Lincoln's chair at the Ford Theatre to Rosa Park's bus. Visit the museum's Greenville Village, home to over historic buildings demonstrating 300 years of American life. In the 19th century, Cleveland became a major industrial center for iron and oil after construction of the Erie Canal and the railroads. Onshore, experience the history of Cleveland's rise and its present revival with a trolley tour of historic sites, including Wade Memorial Chapel and the West Side Market. In the afternoon, visit the Rock and Roll Hall of Fame Museum and take in waterfront views of Lake Erie. 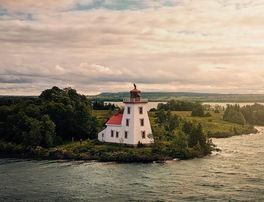 Buffalo is well known for its lake-effect snow and spicy wing sauce, but the city has long served as a critical Great Lakes crossroads, located at the head of the Niagara River on Lake Erie as well as the western terminus of the Erie Canal. American millionaires such as Rockefeller and Ford called it home in the early 20th century, and the city's historic homes and public parks are testaments to its gilded age. Explore the city or take an optional tour of the magnificent Niagara Falls: a drive to picture-perfect Table Rock, an al fresco lunch, and the famous Maid of the Mist tour of the falls (raincoats provided). The Niagara River flows between Lake Erie and Lake Ontario, tumbling over the 194 feet of limestone escarpment at Niagara Falls. The great falls provide hydroelectric power to communities in both the United States and Canada, but makes the river difficult to navigate for ships. ​The first Welland Canal was constructed in 1829 to allow ships to go around the falls rather than over them! On board, take a stroll on deck to watch our descent through the 8 locks of the modern Welland Canal. 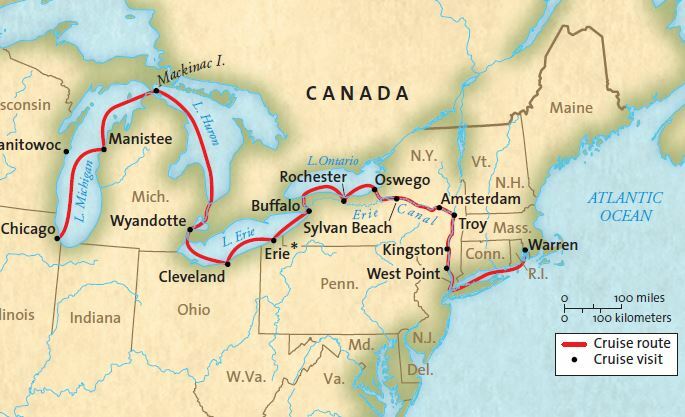 You'll sail close to the southern shore of Lake Ontario on your way to the Erie Canal. The High Falls on the Genesee River were the first draw for American settlers this far west in 1789. The extraordinary power of the falls proved critical to the economy of Rochester, which became Flour City after all the mills in operation. Later, the city was better known as Flower City for the horticultural and seed companies that called Rochester home. On our visit, an optional Cultural and Historical Tour of Rochester introduces you to the famous residents of the town, including Susan B. Anthony, Frederick Douglass and George Eastman, of Eastman Kodak Company. The tour will also visit the High Falls on the Genesee River, the Brown's Race Historical District, and Rochester's historical neighborhoods. The port at Oswego is strategically located where the Oswego River enters Lake Ontario, and its navigable waters made the city a critical site for fur trading between Iroquois, French and British settlers. To catch a glimpse of its beautiful waterways, your ship will travel through Lock #8 of the Oswego Canal, one branch of the New York State Barge Canal System. 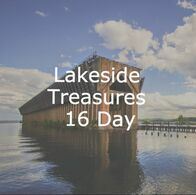 Spend the day exploring the city's historic buildings and main shopping district or take the optional Oswego Historical Walking Tour to discover breathtaking views of the city from the Harbor Rail Trail as well as the Richardson-Bates Museum, a restored Victorian manor. Sylvan Beach is a popular resort town on the shores of Oneida Lake. Known as the "Coney Island of Central New York," the community has been a summer holiday destination since the 1920s. Spend your time on the sandy beach or catch a band during the Summer Concert Series; it's the perfect place to relax and enjoy your cruise down the historic Erie Barge Canal. Sail though the remnants of old New Netherlands, where Dutch settlers lived before England claimed the northern colonies. Docking at Amsterdam, New York, you'll have several optional excursions to choose from. Visit Cooperstown in the Catskill Mountains, the birthplace of baseball and home of the National Baseball Hall of Fame. Explore the historic village at the Farmer's Museum or soak up fine art and photography at the beautiful Fenimore Art Museum. Today the ship shows off one of its most innovative designs. As it passes through the locks bypassing Cahoes Falls on the Mohawk River, the ship's retractable pilot house lowers to travel under low bridges. In the evening, docked at Troy, New York, enjoy a delightful dinner and performance by a local musician. Founded by the Dutch in 1669, Kingston passed on through British to American hands and served as the first capital of New York State. The city marks the entrance into New York's famous Hudson River Valley. Begin your journey with a visit to the Hudson River Valley Museum. Take the optional Historic Hyde Park Tour to Springwood, the beloved home of U.S. President Franklin D. Roosevelt. Here, visit the Presidential Library and Museum and tour the home of this remarkable American family. Continue your sail down the Hudson River Valley with a stop at West Point, New York. The optional tour visits the United States Military Academy, West Point. Founded during America's Revolutionary War, the site is the oldest continually occupied military post in the US. The West Point Museum offers a stunning collection, and the Cadet Chapel Its position on high ground above the river offers a splendid view of the Valley below. The final day of sailing follows the Hudson River along the western edge of the island of Manhattan. Marvel at the city's iconic skyline, and enjoy views of the Statue of Liberty, Ellis Island and Battery Park. Your ship will dock at Chelsea Pier, placing the High Line and Chelsea Market only a few steps away. Head Uptown towards Broadway and Central Park or Downtown towards Times Square and the Empire State Building on the optional Hop On, Hop Off Big Bus Tour.